When it comes to investment strategies, the buy-and-hold strategy has perhaps been the holy grail. When done properly, buy and hold investing seems to be the most effective strategy for investors. While there are advantages to using this investment strategy, it certainly has its share of flaws. In fact, in the past years, this investment strategy has received some major criticism, being claimed as a non-productive and invalid strategy. In this blog, we are going to take a deeper look at the buy-and-hold investment strategy, its advantages and disadvantages, an alternative solution, as well as some additional helpful information. What is a Buy and Hold Investment Strategy? By definition, buy and hold is an investment strategy that investors apply by purchasing investment securities and holding them for long periods of time. The belief is that it is better to allow security to have the opportunity to grow over time, as opposed to attempting to trade in and out of a stock for fast returns. Investors who use this strategy typically believe that the economy will grow with time, and by avoiding selling owned securities during cyclical downfalls, they will have more success over an extended period of time. Perhaps one of the biggest arguments in favor of this strategy, though, is that when investors hang on to securities for long periods of time, it requires less frequent trading that other investment strategies — which results in minimized trading costs, therefore increasing the overall net return of an investment portfolio. In recent years this investment strategy has received a lot of criticism, with many professionals in the investment world claiming it to be non-productive and invalid. For example, the bear market that was in effect after the Great Recession is when many investors and traders parted ways with the strategy all-together. What’s more, many more unlucky investors began doubting the strategy’s effectiveness during — what’s known as — the ‘lost decade’ for stocks, when their strategies resulted in a nearly 0.00 percent return to investors. Although there is some truth to criticisms made against the buy and hold strategy, there are some advantages that some investors still find worthy. Let’s take a look at both the advantages and flaws of a buy and hold investment strategy. While there is a lot of debate about the effectiveness of buy and hold strategies, the strategy does have some advantages. Buy and hold is an easy investment strategy to implement, which is why investors typically choose to use it. The process is fairly simple, investors identify strong assets with the potential for long-term growth, purchase them, and hold them over a long period of time. There is no need to monitor or trade as the short-term trends and volatility may suggest. Even though transaction fees have significantly dropped over the years, investors generally have to pay some price when they are trading. The more you trade, the more costs you will have. Plus, the more you pay out in expenses, the fewer funds you have to pocket or reinvest in order to attain compound growth. All financial traders and investors know that trading on emotion can be a costly mistake. When investing, it is vital to keep the emotions to a minimum and maintain a disciplined approach. Not having to worry about short-term price fluctuation or market volatility, investors utilize this strategy to stay on track. Of course, these advantages look great on paper, but at a more detailed level, there are a few flaws in utilizing a buy and hold investment strategy. The buy and hold strategy may seem like a safer investment model, but just like other investment strategies, buy and hold investing is not above the element of risk. This investment strategy certainly has its share of downfalls, let’s take a look at some of the most essential flaws of buy and hold investing. Market analysis can identify periods of time where it is problematic to be heavily invested or opportunistic to be aggressive. With buy and hold strategies, market analysis is ignored since securities are purchased and held for extended periods of time. Not to demolish the idea behind buy and hold strategies, but it is not always guaranteed that stock prices will go up. Many investors tend to purchase stocks at the end of a bull market, only to eventually watch them drop for years through a bear market. Within the last century, the stock market went up an average of approximately nine percent each year. However, that is only an average. There have been long periods when stocks underperformed risk-free rates of return, and when stocks even turned in negative returns. In certain scenarios, volatility is not always a bad thing. In fact, many successful investors view volatility as an opportunity to purchase securities at bargain prices and sell trending overpriced investments. Many investors that utilize buy and hold investment strategies will change their mind after experiencing a huge loss, causing them to panic and sell low, resulting in large drawdowns. Most of the stocks that are worthy of purchasing and hanging on to tend to be priced at a premium. This will cause investors to ‘buy high’. Investors that plan on purchasing stock and holding onto it for more than 10 years will want to ensure it from a premium company. When stocks are just lying around in an investment portfolio, they do not produce cash flow, except for dividends; assuming that the stocks pay dividends. If not, they likely will just turn into dust collectors. If investments are not producing cash flow, you are being cheated, once you factor in the cost of carrying. While buy and hold strategies perform well in bull markets when stocks are consistently rising, the reality of the stock market is that stocks will often go through long periods where values decrease or stay flatlined. Sometimes these periods can last a couple of decades! Usually these periods are followed by periods where stocks become very pricey and overvalued when compared to their historical relationships to earning, cash flow, book value, and other factors. For investors that are willing to make the effort, it does not make sense to follow the same approach to purchasing stocks when they are at bargain prices versus when they are at a premium. An investment has more return and less risk when its price is low. That same investment has less upside and greater downside risk when set at a premium price. This kind of behavior is not very logical unless stock prices are low or valued fairly. A popular and classical theory, modern portfolio theory (MPT), is based on the hypothesis that it is possible for investors to design an optimal portfolio to maximize returns by taking on a quantifiable amount of risk. However, because this theory is limited to long-term statistical analysis of market data and portfolios, and it does not include time domain data analysis, MPT’s algorithm investing is limited to a buy and hold model. 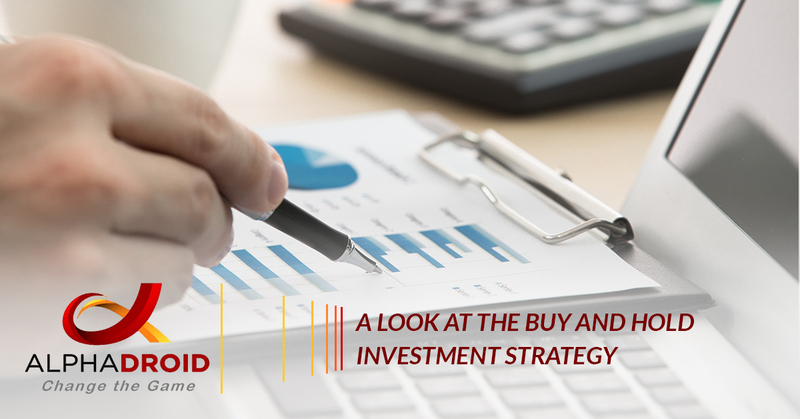 Since buy and hold investment strategies are proven to not be as effective as others, it is wise for serious investors to explore other options. For investors looking for a more effective choice than a buy and hold strategy, an active management strategy may be the best solution. AlphaDroid, a premium financial portfolio management software, supports active management. Rather than purchasing stocks and securities and holding them for a long period of time, AlphaDroid reliably pulls information from market data to better identify which asset classes are showing strengths and other investment opportunities, ultimately helping advisors receive profits while potentially mitigating risk and losses. Using asset allocation, sector momentum measurements, and algorithmic trading strategies, AlphaDroid can automatically sell, trade, and purchase stocks when values reach a certain high or low. If you are ready to discontinue buy and hold investing and have more success in obtaining profit returns while avoiding risk, AlphaDroid is the solution that you need. If you are interested in learning more about one of the best portfolio management software available, start your free trial today!